Now it's time to observe the basic blackjack strategy for hard hands. But what are the hard hands strategy? Is it different from the soft hands strategy? And why are they called so? Let's make it clear first. We may check the blackjack rules and find out that the hard hand is a starting pair of player cards which don't contain an Ace and which is un-paired. E.g. it may be the King + 5 with 15 points total. 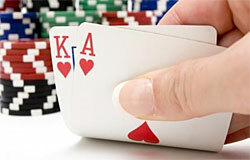 We must point out that the hard hands form the majority of starting combinations the player receives from the dealer. So keep it mind and thus explore this article attentively. This kind of hand is named hard due to its go bust possibility after your first hit. For example you have your King + 5 initial hand (which total is 15 points) and then you hit. Additional card arrives and it is, say a Jack or just 10. At this rate your three-card hand weights too much (25 points) and thus you go bust. With this in mind let's pass on to the basic blackjack strategy for hard hands charts (both for single deck blackjack card game and multiple deck blackjack). Now we may present some kind of assistance for you to understand the charts and interpret its valuable knowledge in a proper way. For example you get your starting hand containing the Queen and 2 which total is 12 (watch first column) and the dealer hole card is 2 or 3 (watch the third row). As a result you are suggested to hit (dark-grey H cell in the chart). If the dealer obtains 4 thru 6 then you stand. 7 thru an Ace dealer face-up card makes you hit with your total of 12. Use the same mechanism for other variants of hands and thus increase your chances for winning.